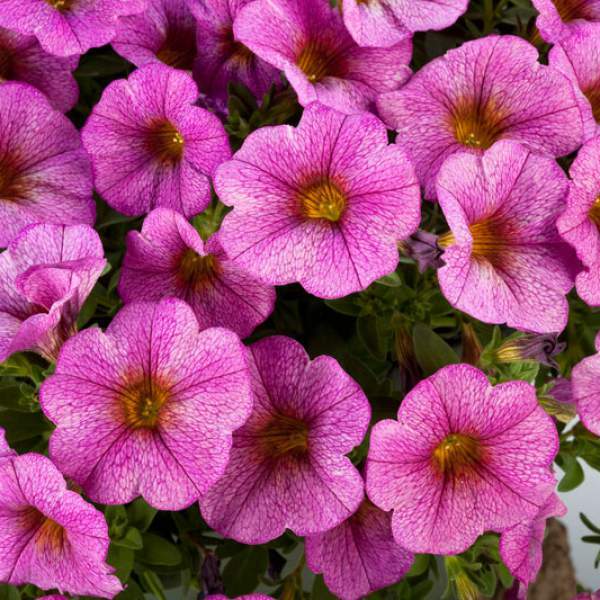 Petchoa is a hybrid plant created by Sakata under the name SuperCal because it combines the best aspects of Petunias and Calibrachoas into one plant. From the petunia side, Petchoas have strong roots and large flowers. From the calibrachoa genes it gets vibrant colors that hold up well in harsh conditions. The early flowering time makes Petchoa a desirable addition to a spring program for those shoppers looking for color before your traditional plants are ready to sell. Grow these plants for beds, hanging baskets, or as flowering cascaders in your combination pots. For best results with Petchoa, we recommend using a constant feed program of 250-300 ppm N with an EC level between 1.5-2.0. Maintain a pH between 5.5 - 6.0. Extra iron can be applied to promote good leaf color. Grow Petchoa in a cool environment of 50-55F night temperatures. This will help keep the plant compact and encourage a well-toned growth without the use of PGRs. SuperCals can even take heavy frost, which makes them a good choice for cold-frame production. Our production schedule listed below takes into account colder temps. If you are not going to grow in a cold house, you can achieve faster production by 10-14 days. Can be grown pot tight in an 1801. Space pots adequately to allow for light penetration and airflow between foliage of adjacent pots. We recommend six inches for 4” pots and eighteen inches for 10” pots. Aphids, leafminers, whiteflies, and thrips are the primary pests attracted to Petchoa. Supercal Artist Rose are not prone to many diseases, but watch for botrytis while the days are short. This grey rot is usually associated with wet or humid conditions. You can prevent botrytis by allowing the plant to dry out between waterings, allowing for good airflow in your greenhouse, and spacing to allow the sun to penetrate to the soil level. The most common chemicals used to treat botrytis are Medallion and Banrot. Use them as a drench according to each label’s instructions. Grow Petchoa in a cool environment of 50-55F night temperatures.